One of the most frequent questions young people are asked is what do they want to do when they grow up and finish school. Many times they respond with some of the things they are interested in and, frequently, it may have to do with the financial outcome. The answers have a different ring to them. The first set are interested perhaps in gain for themselves, whereas the second group are looking to give back and take care of others. These responses could be closely aligned with the scriptures from last weekend that spoke of how both Jeremiah and Jesus were living their lives for others. This can be a hard thing to do because sometimes standing up for what is right and just can be difficult. It puts a different definition on the real meaning of love. In today’s day and age, the challenges in doing the right thing for the right reason are forever before us. Why do we do the things we do? For whom do we do it? So, what do I choose to do? Do I stay on the safe path, that which is okay but doesn’t move me out of my comfort zone? Or if I move out of my comfort zone, how do I accept rejection or negative responses from others? The constant stretching can become tiresome. When is enough, enough? I don’t have the answers but I have been experiencing that stretching lately and wondering. I am grateful for those who surround me and continue to challenge me to move on. I am also grateful for the time at prayer even though it may be dry at times. We just need to keep showing up. These are a lot of wonderful questions to reflect on! Let’s be grateful for the questions and just be with them. May your week bring you many opportunities to grow and be there for others. That is discipleship. That is mission. That is the love Jesus and Jeremiah had for the people. Happy stretching! It is worth it. 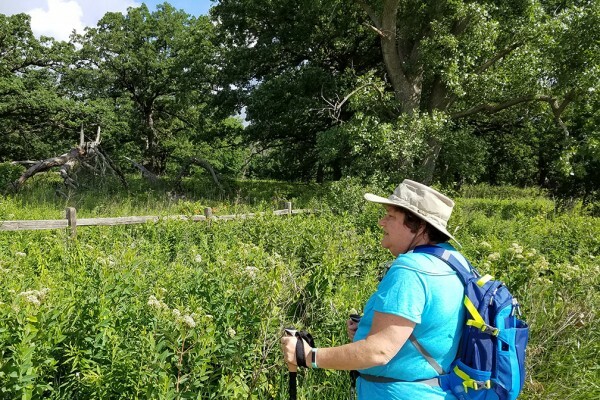 Photo of Sr. Danielle Jacob, CSFN, during a hike in 2017.